SamuiBus.com | Book Airport transfer to Lipa Noi in just a few minutes! Lipa Noi Beach is situated in the less inhabited by tourists part of the island. The usual picture from this coast – ferries and passenger catamarans ply on the edge of the horizon leaving the port of Nathon or coming into it. Green framing of the beach is rich and various: coconut palms generously supplemented by the plumeria trees, coniferous trees and shrubs. A feature of the local landscape is that it creates the feeling of relaxation not on the tropical island, but on the lake in a more familiar latitudes. Сhoose best hotels on the Lipa-Noi beach. 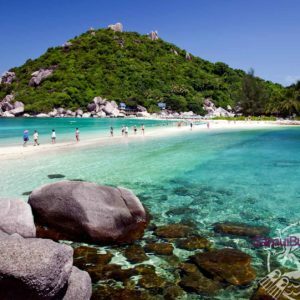 Get from the Koh Samui Airport to the hotel in Lipa Noi Beach and back will be so easy if you will think about it in advance. Just book Transfer service!